As a residential shelter, Mothers’ Home provides a safe haven for vulnerable pregnant women in crisis who choose life as a sacred gift. We encourage our mothers to celebrate the joy of new life and help them to prepare for their future and the future of their child. We focus on physical, emotional and developmental needs including positive life skills, parenting and job preparation. We strive to assist our mothers to reach their goal of independence and self-sufficiency. Mothers’ Home is a residential shelter which provides a safe haven for vulnerable, pregnant women in a crisis who choose life as a sacred gift. Mothers’ Home is located in Darby, Pennsylvania and was founded in 1991 as a program to provide hope and support for young adult women who choose life for their unborn child despite rejection, abandonment, and ongoing obstacles. Mothers’ Home provides shelter for up to 28 women during their pregnancy and the first 6 months after their babies are born. In the basement a Community Outreach is provided via the Sharing Space which is comprised of a Baby Clothing and EquipmentÂ Boutique. Low-income families can come to shop for gently used baby clothing, equipment, and household items that have been donated. A small fee is charged to cover room upkeep and cleaning supplies. 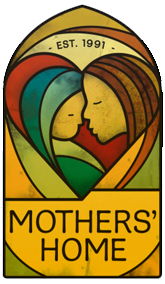 Mothers’ Home was founded in 1991as a shelter for homeless, pregnant women in need of a safe and stable environment to prepare for childbirth. The story of Mothers’ Home begins with Dr. George Isajiw and his family. From 1981 to 1991 the Isajiw’s opened their home to care for 28 homeless and pregnant women. As a practicing physician with a concern for the most vulnerable, Dr. Isajiw engaged his personal network to assist in his dedicated effort, and he organized and coordinated with 10 other families to host additional pregnant women in need. This network quickly gained momentum, and the host families were soon receiving more referrals than they could accommodate. The host families also discovered that many of the girls they were sheltering were dealing with issues of addiction, mental illness, and HIV, in addition to crisis pregnancies. Recognizing the limitations of a purely volunteer staff, Dr. Isajiw and his network were able to raise the funds necessary to secure a more permanent site with skilled staff. Fortunately, the empty convent on the Blessed Virgin Mary campus in Darby was available. During the time the BVM site was being renovated, the young women lived in a large home in Lansdowne. The convent was ready for occupation in 1993, and since that time has housed over 1,000 homeless pregnant women. Mothers’ Home gratefully acknowledges initial funds to support the efforts for the pregnant and homeless women, especially the efforts provided by the Delaware County Pro-Life Coalition, the Delaware County Lawyers for Life and individual donations from many good people. At present, 28 young women can live at Mothers’ Home. They all participate in free daily classes on life skills, nutrition, parenting, labor and delivery, early infant care, housing, fertility awareness, and budgeting. There are occasional legal clinics addressing domestic abuse. Women of all races, religions, and ethnicity are welcome. The residents are required to perform 10 hours of community service each month. These service hours are usually performed in the Sharing Space, where clothing and items are made available to the community. Mothers’ Home actively promotes principles of personal responsibility, self-respect, respect for others, and mutual support. Case Management is provided to assist residents to define and obtain their personal goals. Residents usually remain at Mothers’ Home for 6 months after the delivery of their babies. The popular Step-Up Program allows for 4 mothers to stay an additional 12 months at very low rent in two recently renovated apartments located in the building. Former residents often return with their children to share with current residents their experiences since leaving Mothers’ Home. This is truly a Circle-of-Life encounter– a joyful and rewarding time for all! We at Mothers’ Home try to help our young mothers gain confidence, learn parenting and life skills, and ultimately move forward in life with the tools necessary to live stable and rewarding lives. Ultimately, our aim is the same as it was when Dr. Isajiw founded Mothers’ Home 25 years ago: to provide a safe shelter that encourages a healthy environment for the life of the baby, the life of the mother, and their future life as a family.